2017 has been a good year for found footage horror, so much so that when I turn on a film to discover it has been made in that format I don't feel revulsion, but instead intrigue. 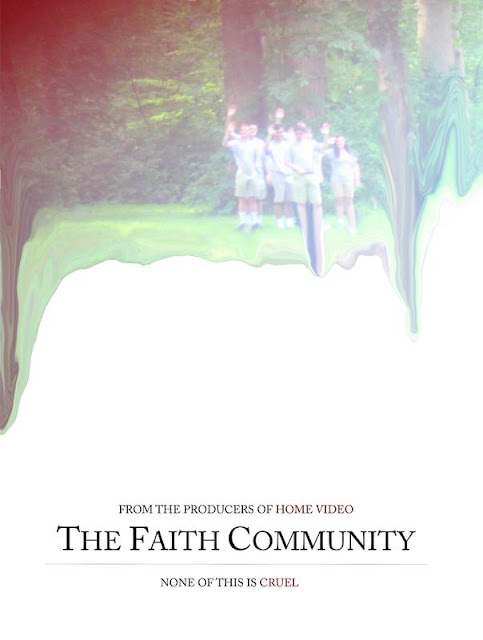 In many ways The Faith Community (produced, written, and directed by Faith R Johnson) is fantastic, it goes back to basics with the found footage being extremely amateurish, this helps to add a good dose of realism that even some of the less stellar acting can't really take away from. The whole plot is also a big shining point here, I haven't seen a story like this in a found footage before, yet at a crucial moment the ball is dropped which really was a damn shame. The way The Faith Community is filmed is very raw in feel. 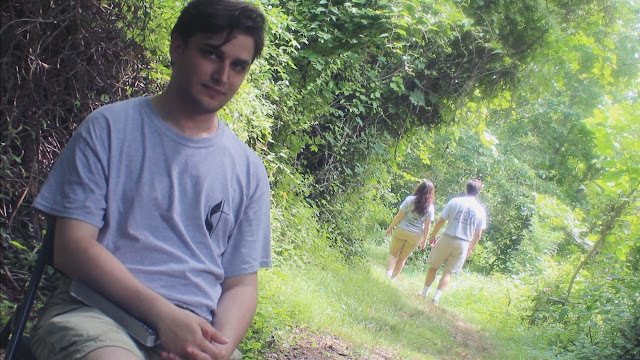 Colin is a terrible camera man, awful in fact. His shots are nearly always out of focus, he is forever fiddling around audibly with the camera as he films, and he has a stunning habit of missing peoples heads out of shots. Because of this a layer of authenticity is created that sustains throughout. 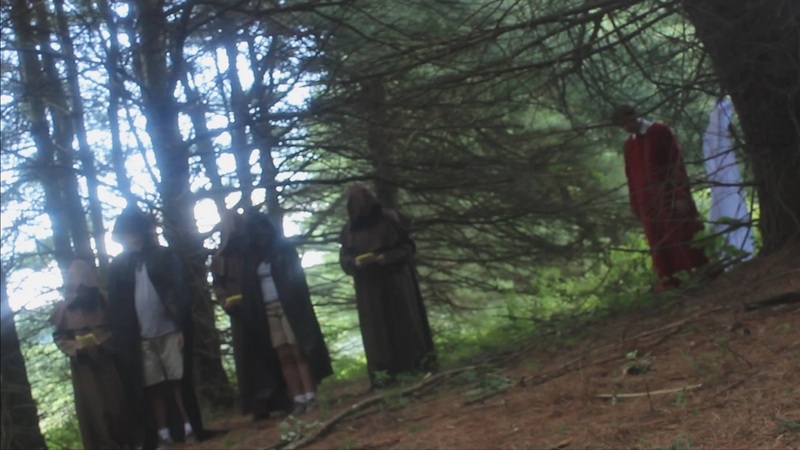 I always find it so immersion breaking to have found footage where the camera shots are perfectly framed constantly, here they are rarely well framed, only in one scene, and that is amusingly when one of the cult members (for that is what the trio have unknowingly joined up with) has set up the camera themselves. There is a vein of jet black humour that runs throughout this, several times I almost laughed out loud in purposefully set up moments. Colin who is the least religious of the three is constantly swearing, something the other two are constantly calling him up on, when events have started to take a dark turn they still obliviously call him up on his language that I found amusing. Another great scene had Andrew gushing with praise to The Messenger as unseen to him, just in the background what appears to be a corpse is being dragged away. I loved these little moments of levity. There are four actors who really bring a lot of enjoyment to this movie. Colin and Andrew were the most realistic. I loved Colin's frank nature and how he deals with the rising threat. This is shown initially with a meal scene where his hands are the only thing on camera (as he has set it down), but you can visibly see his hands shaking having witnessed what he just had done. Andrew on the other hand is a super dork who is captivated by what he is seeing to begin with, but then later on his transformation into terrified is plain fantastic, the interactions between Colin and Andrew feel so believable. The other great part of this is The Messenger, Harris puts in a spell binding over the top performance that demands attention, just like the cult leader he is portraying. His theatrical performance is perfectly explained on camera and leads to some surreal moments that work well, such as a musical number he starts singing during a disturbingly real play he and his members have put on for the visitors. I got a huge The League of Gentlemen vibe from this sequence. Sometimes with him in particular he seems to stumble over his lines, I don't know if this was accidental or on purpose but it adds another layer of realism to the proceedings by making him seem all the more normal. Of the other characters they are a patchy lot, some come across as pretty average, but least these only have small parts to play. It is a good half hour at least before anything horror like begins, yet I didn't mind, it was so obvious that there was something not right with the group, and there was some original ways this was hinted at. 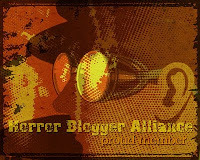 A good chunk of the first third is comprised of interviews Colin is doing with The Messenger, and then his right hand man Michael (Oliver Palmer). These interviews again are carried out in a clever way. The Messenger does several takes for Colin, yet each time he says the exact same sentences, with the exact same inflections that makes for a creepy tone. Michael gives the first foreshadowing that there really is something wrong, with a story about what led to him leaving the army, that leads into the great middle part, which then goes into the disappointing finale. I will say though that I really appreciated nothing is very explicitly explained; is The Messenger an expert at brainwashing, are his followers all drugged, or is there even a supernatural explanation? I liked this was left up to the viewer's imagination. I had high hopes by around the hour mark of The Faith Community but when things eventually go wrong this was when it began to unravel. With around fifteen minutes to go an event occurs (annoyingly just off camera) that leads to someone else filming the final part of the movie, however this section was very dull, each moment sucking away the momentum that had been built up. I appreciate what was being attempted with this, and there was some hinting at what could really be going on, but to be truthful if this final part had been cut entirely (save the final shot which was cool) this film would have benefited a lot. There is much to like about The Faith Community, it has an original story done well, some great performances, and an approach to filming that is either inspired or an act of lunacy, but the final third just dragged for me. However if you have even a passing interest in found footage then you need to see this, it may be rough around the edges but it proves there is strong life left in the old style way of making these films. The Faith Community has just entered distribution on Amazon Video, Roku, and Amazon Fire TV thanks to POV Horror.